President Zimmer joins staff members of the Office of Multicultural Student Affairs in cutting the ribbon that marks the opening of the office’s new center at 5710 S. Woodlawn Ave. It was a true celebration at the grand opening of 5710 S. Woodlawn Ave.
Over the rhythm of African, Caribbean and East Indian drummers, students, faculty, administrators and staff sipped sparkling cider and clapped to the beat before President Zimmer delivered opening remarks. Kenneth Warren, Deputy Provost for Research and Minority Issues, addressed the powerful role students played in the establishment of 5710, which he said was five years in the making. 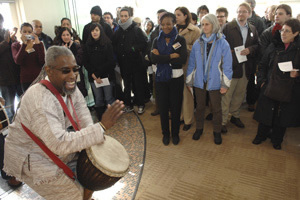 African, Caribbean and East Indian drummers entertained a crowd of students, staff and faculty who attended the opening celebration. Alumna Lizette Durand (S.B.’01, Ph.D.’07), who was dedicated to diversity issues at Chicago during her years as an undergraduate and a graduate student, spoke about the value and importance of 5710 S. Woodlawn Ave. from a student’s perspective. In addition to efforts by students, President Zimmer, the Office of the Provost, members of the College community, the Office of the Vice-President and Dean of Students, Warren applauded the efforts and commitment of Ana Vázquez, Director of the Office of Multicultural Student Affairs and Deputy Dean of Students in the University, and William Michel, Assistant Vice-President for Student Life in the University and Associate Dean of the College. “A very committed group of students, faculty and staff have worked together to strengthen this project over the last five years. 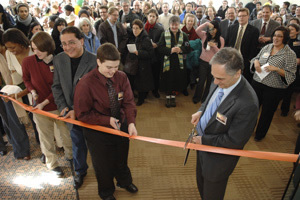 This center celebrates our diverse community and will benefit all students at the University of Chicago,” Michel said. 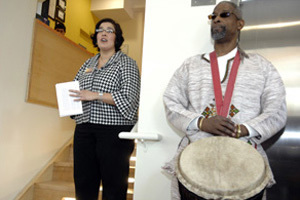 Ana Vázquez, Director of the Office of Multicultural Student Affairs (left), addresses a crowd that gathered to celebrate the opening of the office’s new center at 5710 S. Woodlawn Ave.
Vázquez added that the center would create a space for students of color and LGBTQ students to build community and create a sense of belonging on campus, while spreading awareness about those student groups. It would also make resources and advocacy readily available and provide a space for candid discussions on race, ethnicity, sexuality and gender identity. Before guests at the grand opening began tours of the building, Kimberly Goff-Crews, Vice-President and Dean of Students at the University, asked those in the crowd to raise their glasses for a toast. “To our past, present and future—in honor of the students, faculty and staff who worked tirelessly to make this happen,” Goff-Crews said.